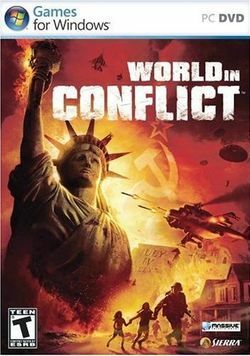 World in Conflict (also known as WiC or WIC) is a real-time tactical video game developed by the Swedish video game company Massive Entertainment and published by Sierra Entertainment for Windows PC. The game was released in North America on September 18, 2007, September 20, 2007 in Australia and New Zealand and, in Europe on September 21, 2007. The game was played in the 2007 Cyberathlete Professional League (CPL) World Tour. Generally considered a real-time strategy (RTS) game, World in Conflict includes gameplay typical of real-time tactical (RTT) games. Nicklas Cederström, one of the designers of the game, stated that internally, World in Conflict is considered an RTT. At the end of the 1980s, the Soviet Union found itself unable to compete with the United States because of its bankrupt and disorganized economy. Funds for the Soviet nuclear and conventional arsenal were becoming scarce. This led to increasing cuts in the civilian sector, which created widespread famines and supply shortages. The game takes place in an alternate history scenario, where, at this point, the Soviet Politburo decided to blackmail Western Europe to get the aid they needed or invade Western Europe and take it themselves. The player experiences the war through Lieutenant Parker of the United States Army. At the beginning of the game, he is on leave in Seattle at the onset of a Soviet surprise invasion of the city. What sparse military forces are in the city help to evacuate civilians and then retreat into the Cascade Mountains towards Fort Teller, the headquarters of the United States' Strategic Defense Initiative. While the project was a bluff, the threat of its existence had kept the Soviet Union from launching a nuclear strike. Therefore, the defense of the facility had to be staged as if it were true. The initial attacks are fought off, but when overwhelming Soviet forces enter the area, the Americans are forced to sacrifice the town of Cascade Falls, leaving a group of volunteers behind to pin down the Soviets as a tactical nuke is detonated over the area. The game then flashes back to several months earlier, showing Parker's service in France, in the Soviet Union, and fighting off a limited invasion of New York City by Soviet Spetsnaz, centered around Liberty Island, Ellis Island and Governors Island. In the latter scenario, the Soviets intend to store chemical weapons inside the Statue of Liberty and release them over Manhattan. Foreshadowing the game's final missions, Parker must defeat the Soviet forces before the Army is forced to destroy the Statue and everything else on Liberty Island with a massive airstrike. After the flashback, the game returns to the sequence of events after the destruction of Cascade Falls. China officially enters the war on the Soviet side by sending an invasion fleet to reinforce the Soviet beachhead in Seattle. The President orders the nuclear destruction of Seattle as this fleet arrives - unless the city can be retaken and the Chinese prevented from landing. In the final series of missions Parker's commander, desperate to avoid "another Cascade Falls" on a much bigger scale, orders his forces into a desperate attack. Parker must break through the Soviet lines to reach the city, destroy the heavily fortified Soviet headquarters before the Chinese land and the nuke is dropped, and survive a massive counterattack. The game concludes with a statement that Parker may be called upon to fight later on, hinting of an expansion or a sequel, as fighting continues in Europe and elsewhere. This page has been accessed 28,322 times.